Since I announced that I had a little something special cooking, I've gotten a lot of questions about what we plan to do for Baby TAA's nursery. This has been one of my favorite projects that I've ever tackled. Picking out sweet and soft baby things for the room where we'll take home our little baby girl...well, it doesn't get much better than that! I've never been a 'pink' girl, even as a child. And I knew that our baby girl's nursery wouldn't be filled with pink either, but instead serve as a pretty accent color. When we had our home painted last year, I intentionally chose a light, soft blue for our 2nd bedroom knowing that it would also work perfectly for either a baby boy or baby girl someday. With light blue as a base, I started planning the nursery. To compliment the blue, I chose lavender as the signature color, with splashes of light pink and yellow thrown in. I put together a little moodboard to give a peak as to how I hope it will eventually come together! Brooklyn Nursery Bedding, Pottery Barn Kids: I took one look at this and fell in love. It's feminine without being overly girly and I adore the mixed patterns and colors. 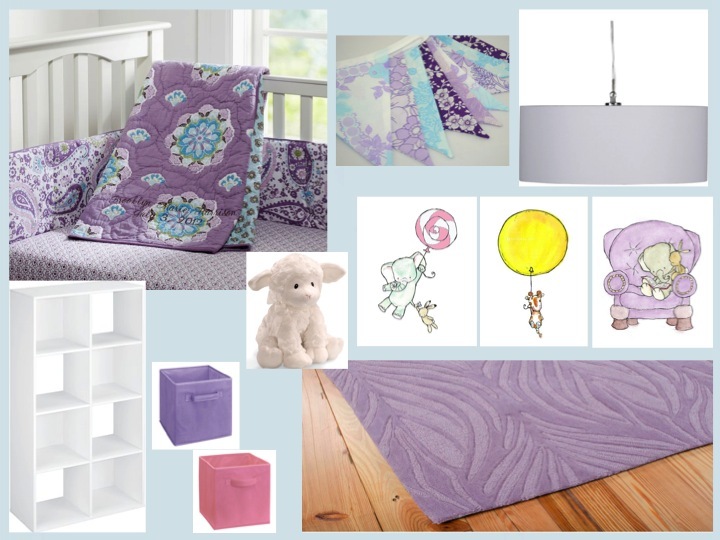 Could it be more perfect for a lavender and light blue nursery? I know the bumper isn't actually supposed to be used until baby is older, but I just love the pretty paisley pattern and so I'm happy to have it for show until it is safe for use. Baby bunting flag, Etsy: I have seen so many nurseries online that have sweet little bunting flags and I think it would be a lovely addition to Baby TAA's nursery. I found some pink, purple and blue scrapbook paper that I can't get enough of and so I plan to DIY my own with this. I'll keep you posted! Eden White Pendant Lamp, CB2; When we had overhead lighting installed last year, again I chose this simple white pendant knowing that it would suit a modern nursery someday. And for $59, you can't beat that. Baby animal artwork, Trafalgar Square's Etsy Shop: What is it about baby animals that just make my heart melt? Though our nursery won't have a true theme, I love animals and so there will definitely be some sweet animal artwork and accents. I'm obsessed with every single print from Trafalgar Square and bonus - they are running a sale that ends today! I also plan to DIY some artwork as well, so I'll keep you posted on that. Lena Lamb plush, Gund via Macy's: Animal love continues. I love little lambs! Cosmopolitan Lavender Rug, Overstock.com: I searched far and wide for the perfect lavender rug and finally went ahead and ordered this little beauty. It's in transit as we speak and I hope that it lives up to the plushness and beauty of the photos. Not to mention that the website photo also pictures the rug on hardwood floors which match ours almost exactly. And for the price? Have mercy (yes, I did just pull out an Uncle Jesse reference). Oh and lastly, the color of our walls is reflected on the board. We chose Benjamin Moore's Sweet Bluette for a nice, soft light blue that isn't overly saturated. A year later and I'm still in love with this color! So that's what I'm loving for our little nursery thus far. We are planning on a white crib and white dresser/changing table so fit in with our modern loft. This weekend we are also getting to work on updating our closet situation and I cannot wait to share that with you in the coming weeks! What are your favorite nursery must-haves? Do you prefer themed baby rooms? If you were designing a nursery for baby girl, what would be your color picks?